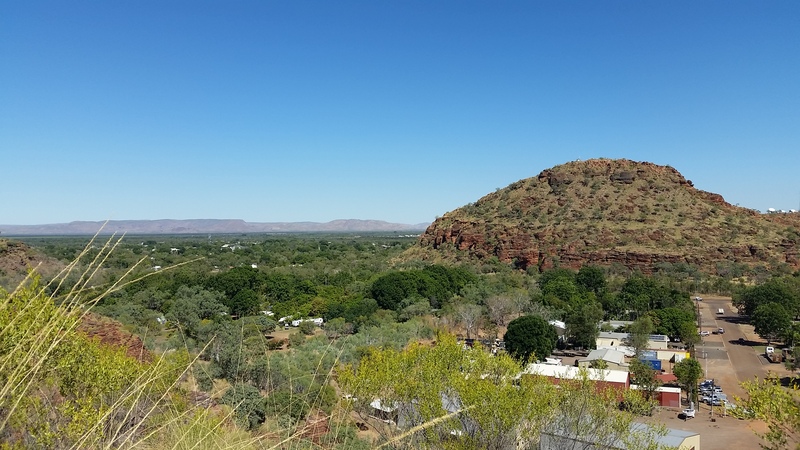 The east Kimberley town of Kununurra was our next destination after our trip along the Gibb, we were looking forward to setting up on some grass and restocking the fridge and pantry. 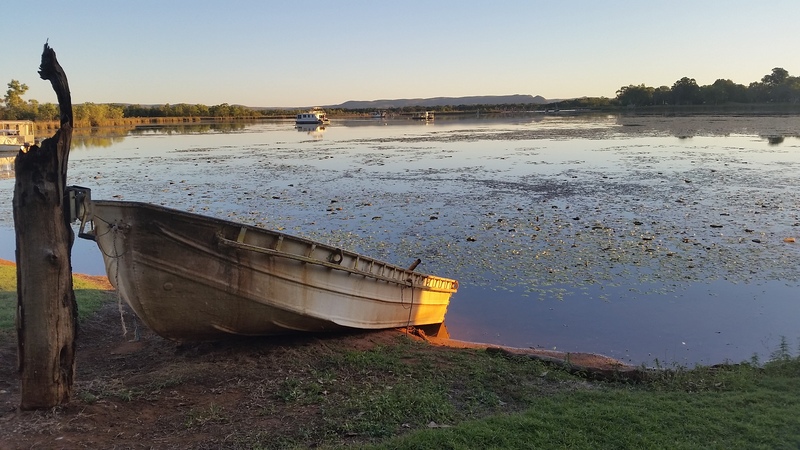 Kununurra, or Knx as the locals call it, was established back in 1963 as the main service hub for the Ord River Irrigation Area and has a population of around 6000 people. 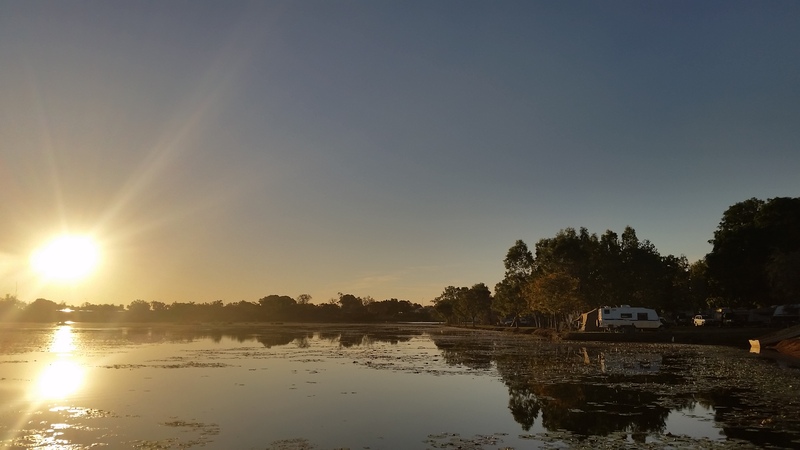 We stayed at the Lakeside Resort Caravan Park, which had a great resort style pool and, as the name suggested, it was on the banks of Lily Creek Lagoon only a kilometre from the town centre. We decided to book in for a week in Knx as we wanted to have a good look around as well as get some school work done. 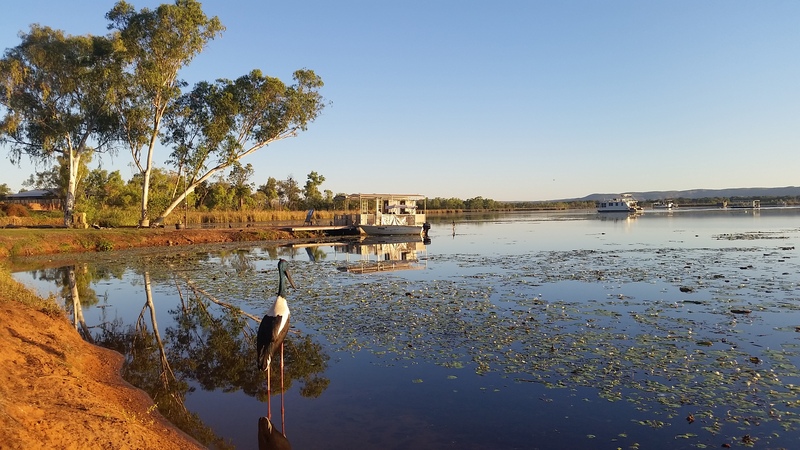 Sunset view from the caravan park onto the lagoon and the resident Jabiru. 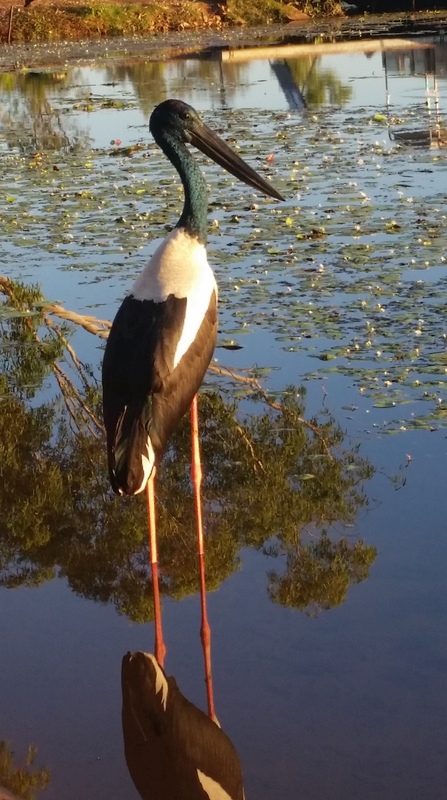 The resident Jabiru, he was so still I thought the park had gone and put a fake statue in the shallows. 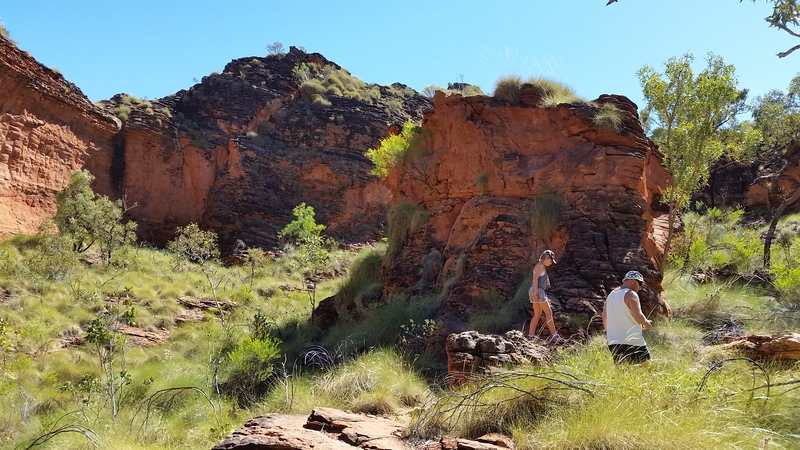 In between the schoolwork, our first adventure had us heading north/ west along Parry Creek Rd heading towards Parrys Lagoon Nature Reserve, but first we were lucky enough to have to cross the infamous Ivanhoe Crossing. 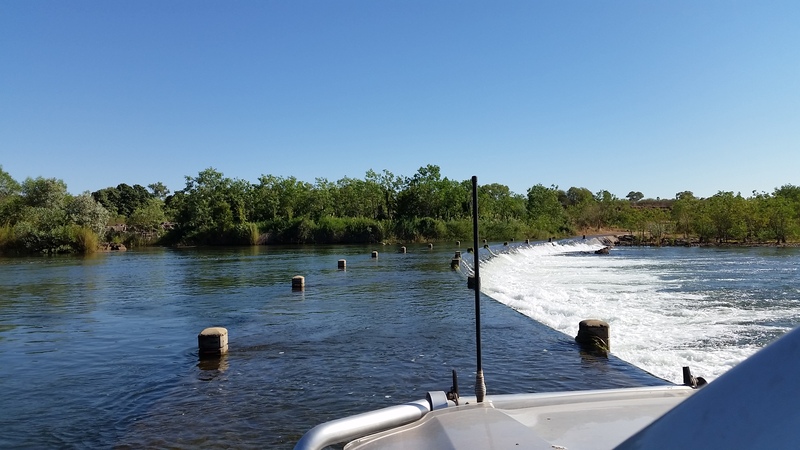 The Ivanhoe Crossing is a concrete causeway that takes you across the Lower Ord River, home to many saltwater crocodiles, but has been closed for the last couple of years due to consistently high water levels deeming it too unsafe to cross. However, luckily for us the local council had quietly reopened it only about 6 weeks ago, so naturally after word had filtered through to us (via facebook of course) it was our first point of call in exploring Knx. After taking the customary photos and assessing the depth and flow of the river we jumped in the car and drove across with absolutely no hassles whatsoever, our side steps didn’t even get wet!!! After the crossing we continued along towards Parrys Lagoon where we first stopped in at the Mambi Island boat ramp, spotting at least one decent sized saltie sunning himself further up the river along the opposite bank. The campground was quite dusty and also offered limited shade so we didn’t stay long. Mambi Island boat ramp, we only saw one saltie and he was too far away to spot with the naked eye. 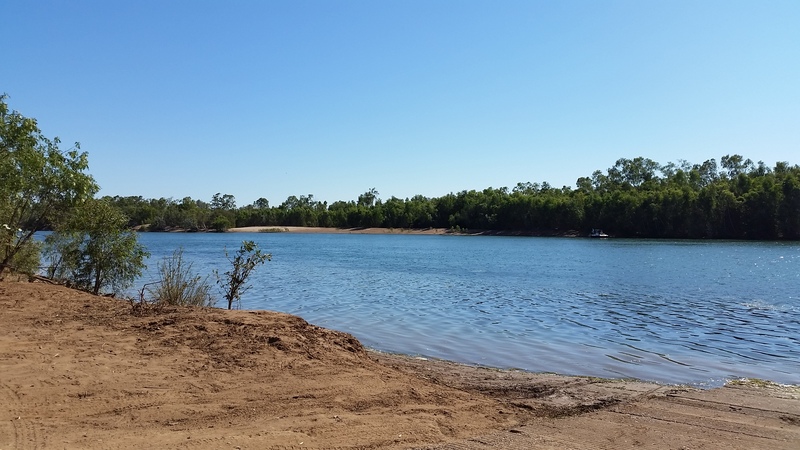 From Mambi Island we then entered Parrys Lagoon Nature Reserve and stopped in at Marlgu Billabong. 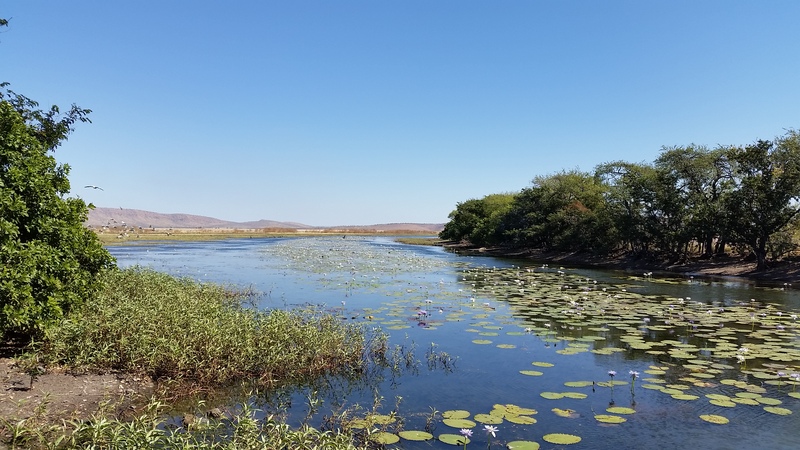 Marlgu is the local aboriginal word for ‘wild bird’, so naturally we were able to sit in the shady bird hide and marvel at the abundance of wildlife. 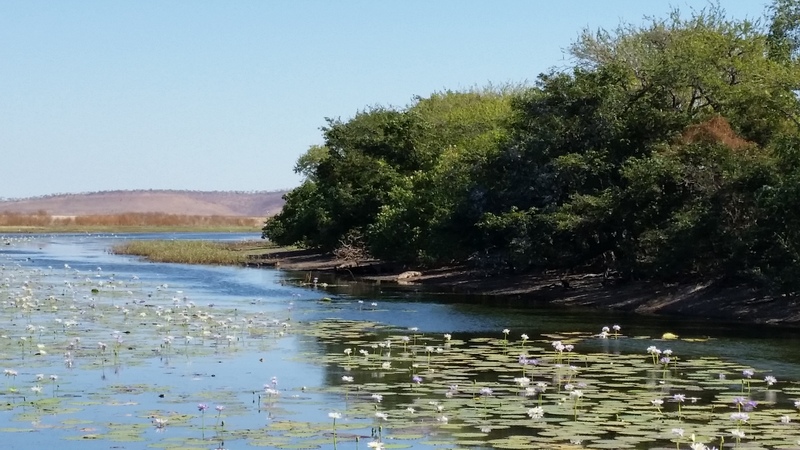 There were catfish swimming under the hide, birds such as egrets, pelicans, spoonbills, herons and whistling ducks, and less than 100 metres away we spotted 4 salties sunning themselves on the banks of the billabong. We ended up staying there for at least half an hour as we were spotting different animals with the binoculars. Amazing birdlife at Marlgu billabong. Can you spot the 3 salties sunbaking on the far bank? It was getting towards morning tea time so we headed to the Rusty Shed Café in ‘Old Wyndham’ down at the port. I had a very decent coffee, whilst Nik enjoyed an iced coffee and the girls shared milkshakes and gluten free raspberry cheesecake, yummo!!! $40 later we left and dropped Nik down at the jetty to have a fish while the girls and I went to do some more around town sightseeing. 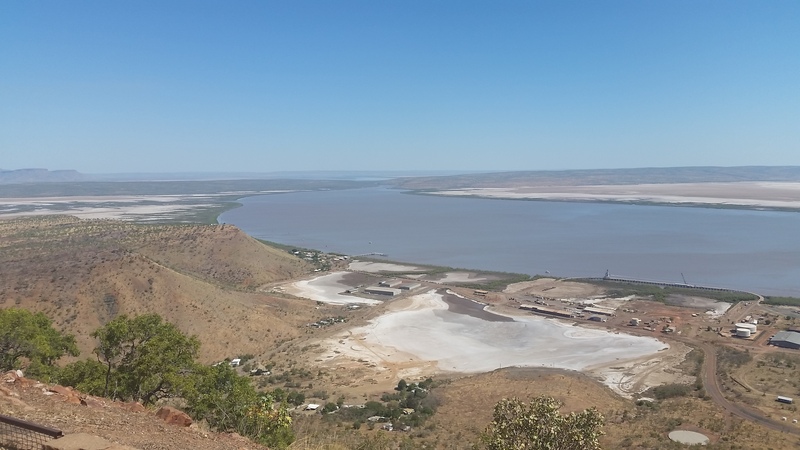 First we headed to the main attraction being the Five Rivers Lookout, which enables views of part of the Cambridge Gulf as well as the beginnings of the Ord, King, Pentecost, Durack and Forrest rivers. We were even able to spot Nik down on the jetty with his fishing rod. 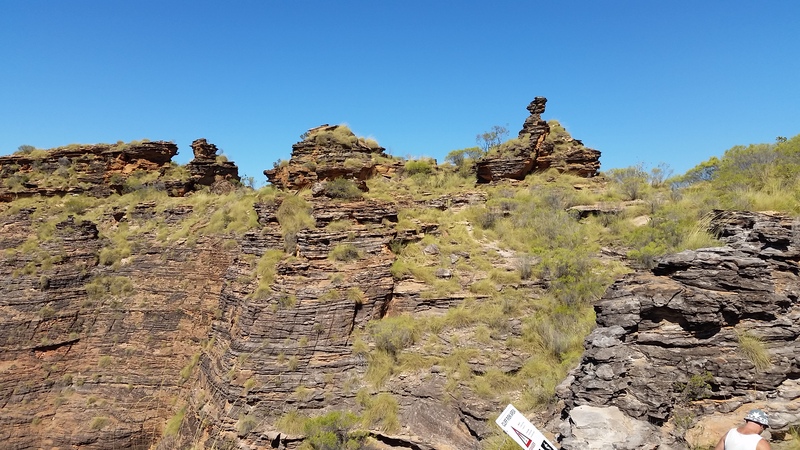 Five Rivers Lookout. Nik is the dust spec on the jetty in the middle…. 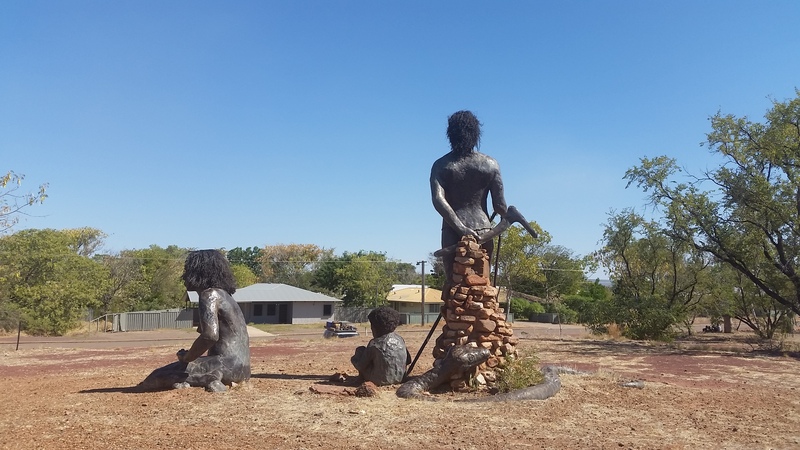 On our way back down to town we called into the Warriu Aboriginal Dreamtime statues, we couldn’t find a plaque explaining the story or the statues, but they were massive and towered above the girls and I. 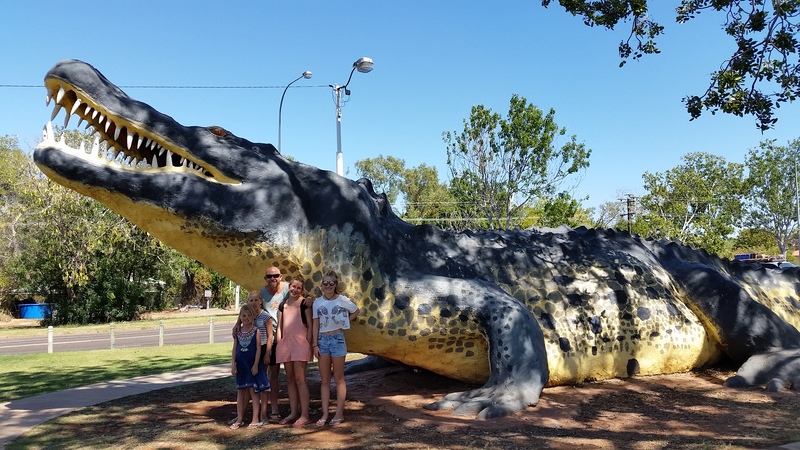 After we headed back to the port and picked up Nik we had some lunch at a nice shaded park, took the customary photo standing in front of the oversized crocodile and started to head back to the van at Knx. 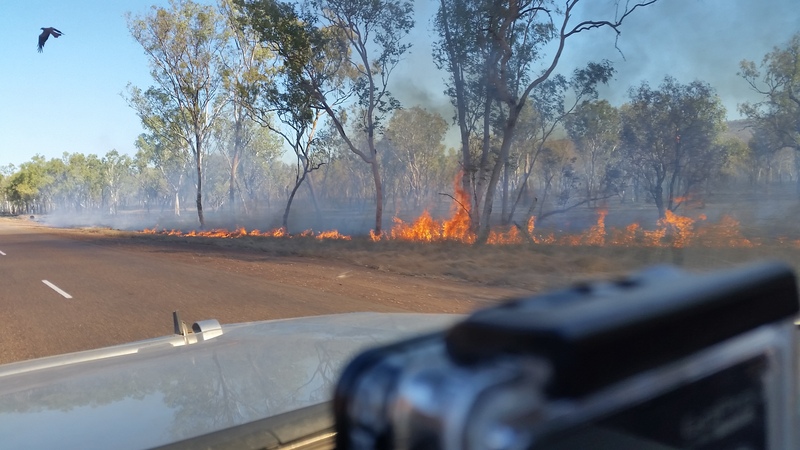 On the way back we also drove past an area of controlled burning, there were hundreds of birds of prey and crows circling the burn off and as we wound the windows down, we were struck by the extreme heat and the fact that there was not another soul around…… Controlled burning like this is common place in the Kimberley this time of year with lower temps and not much wind, unlike the Summer months where the temperatures are often above 40. The giant croc in the centre of Wyndham. 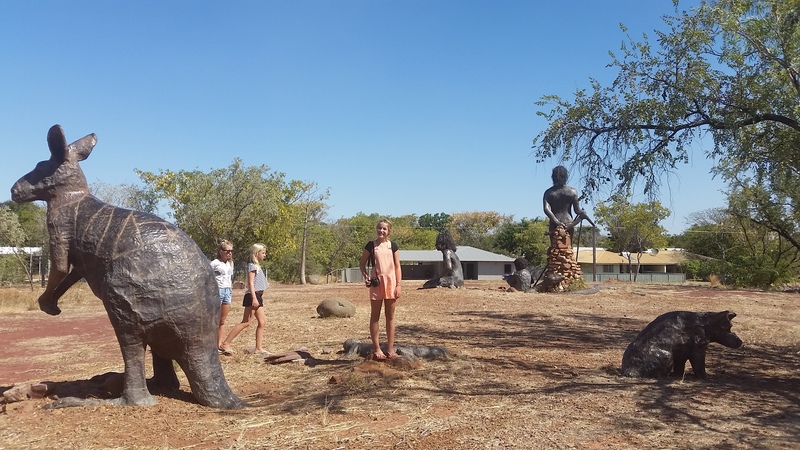 The girls at the Warriu Aboriginal Dreamtime statues. The burn off we drove past on the way back to Knx. 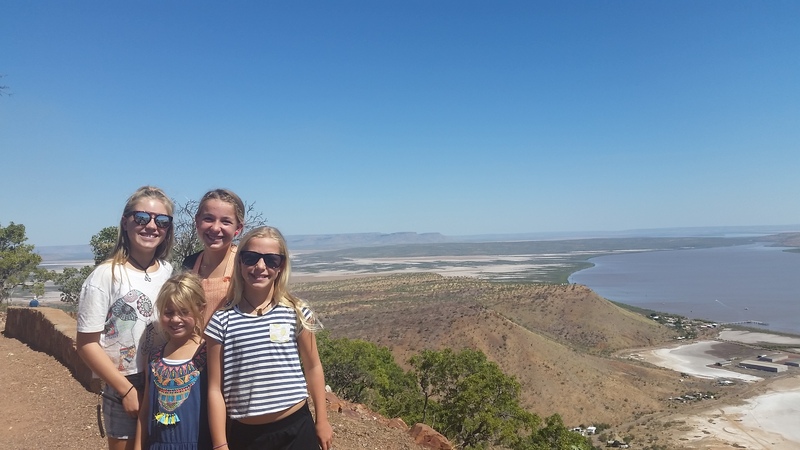 Whilst in Knx we took a drive up to Kelly’s Knob which afforded some nice views of the town below, it actually reminded us of the views of Alice from Anzac Hill. The rest of the week was spent taking it in turns of doing schoolwork and geocaching. 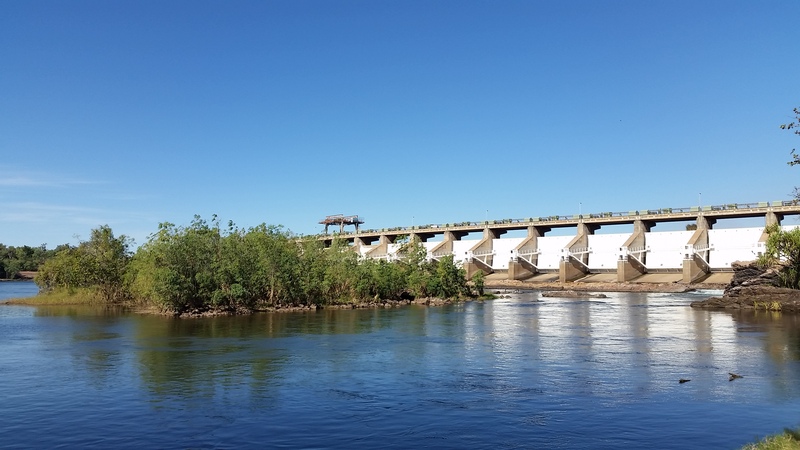 The geocaching took us all around town, including the dam on the Lower Ord River and even the crapper farm…….. 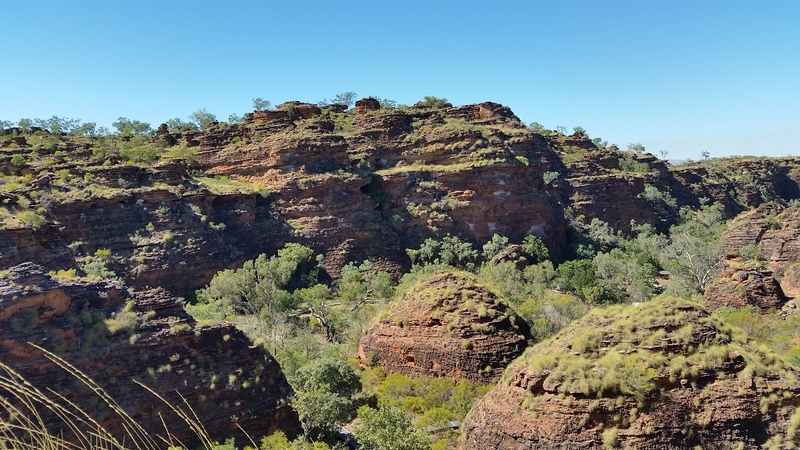 However our best day of caching was when we spent the morning in Mirima (Hidden Valley) National Park, only a stones throw from the centre of town. In between the kids giving Nik and I funny looks, as we were quoting Top Gun and ‘sending you 2 clowns to Mirima’ we did the few awesome walks and found some geo’s. 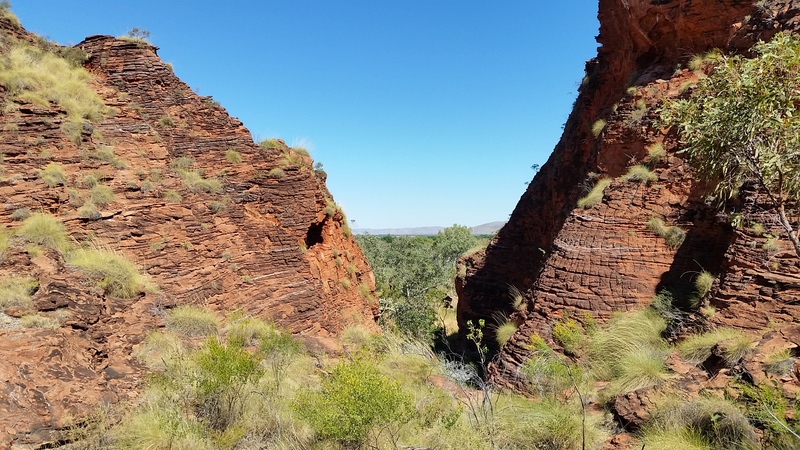 Mirima is very much a mini Bungle Bungles, with the same beehive shaped sandstone domes, albeit on a much smaller scaler. The general concensus in the car on the way home was that it was one of the best parks we had been too!!! Knx from the Kelly’s Knob lookout. 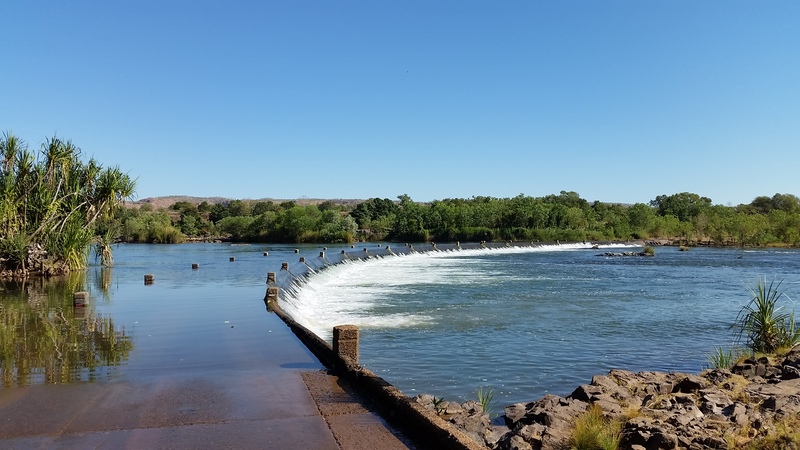 The diversion dam just outside of Knx where Nik had a quick fish before we left. 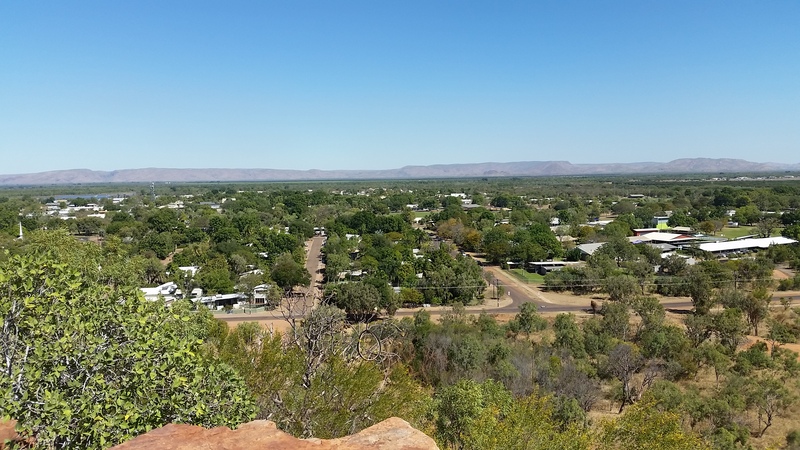 Views of the town from the lookout, the national park is that close to town. Another sneaky view from the national park. Nik and Zoe looking for a geocache. The girls and I also had an enjoyable morning at the Saturday markets in town, we didn’t buy anything but it was fun looking around. Abby and Jess also nagged me about going to the library, so the 2 of them and I headed there after finishing school one afternoon. After we were there for an hour I hadn’t seen them for a while, so I went and had a look in the kids section only to find them curled up on bean bag watching the TV……..we left 5 minutes later!!!! Really liked Kununarra, would love to go back when its a bit cooler. Love your pics as usual, Whyndham is a hit different, but the views are amazing.